We usually think of scientists as being drama-free people. So, it may surprise you that there has been quite a production about sodium and how much is too much. The US Dietary Guidelines suggest we limit sodium intake to 2,300 mg per day and many doctors recommend a 2,000 mg per day limit. The American Heart Association recommends an even lower limit of 1,500 mg per day for people who have cardiovascular disease, are middle-aged to elderly, or are African-American. But do the disagreements of a bunch of people in white coats really affect you? Maybe, maybe not. Because regardless of what the upper limit for sodium is set at, you’re probably exceeding it anyway. The average American consumes 3,400 mg of sodium a day, and 90% of us exceed the 2,300 mg limit on a daily basis. While you might not care about what scientists set the limit at, you probably should care about how much sodium you eat since a high sodium intake may lead to high blood pressure, a leading cause of cardiovascular disease. If you hope for a life without heart attacks, you may want to start cutting your salt intake. One way to do this is by reading food labels and choosing foods that are low in sodium (less than 140 mg of sodium per serving). Another way is to reduce sodium by cutting back on the amount of salt you use when cooking and at the dinner table. The downside to this, though, is the taste. Salt not only adds flavor itself but also enhances the other flavors in the food. This is where MSG comes in. Replacing the salt with MSG can lower the amount of sodium in a food without affecting the flavor. 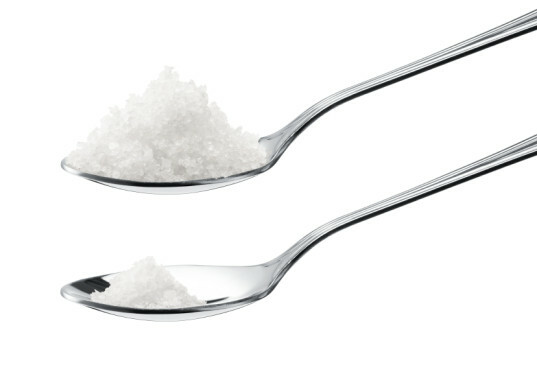 In fact, swapping salt for MSG can lower the sodium content of the food by up to 40% with no impact on how good it tastes. But how can something that contains sodium, monosodium glutamate (MSG), actually be beneficial in a low sodium diet? Allow me to geek out for a minute and explain that MSG contains about 12% sodium while table salt contains 39% sodium. What that means is if you swap even amounts of salt for MSG, you’ll be getting about 1/3 less sodium. The MSG for salt swap won’t work for everything. Baking, for example, is a chemical reaction that usually requires salt to make the reaction happen properly (and your baked goods to come out correctly). But, MSG is a good replacement for salt that is added as seasoning while cooking. Try substituting MSG for 1/3 of the salt you would normally use and then adjusting the amount based on you and your family’s preferences. If you’re nervous about experimenting, then try some of the featured recipes from MSGdish like German Potato Soup or Creole Meatballs. MSG may not be right for people who need to be on a very strict low sodium diet. But, for the average person looking to improve their diet, it could be a small, simple way to reduce sodium without even really noticing. For more about using MSG to reduce sodium in your prepared foods and still maintain the desired flavor, read this previous blog on MSGdish, as well as 5 Facts about MSG as Part of a Low Sodium Diet. Next PostIs Umami MSG? Does MSG Have Umami Flavor?